Truman offers a number of automatic scholarships to incoming domestic freshman students. By completing your free undergraduate application to Truman, you are automatically considered for a number of Automatic Scholarship awards. Currently published information is for students entering Truman in Spring 2019 through Fall 2019. 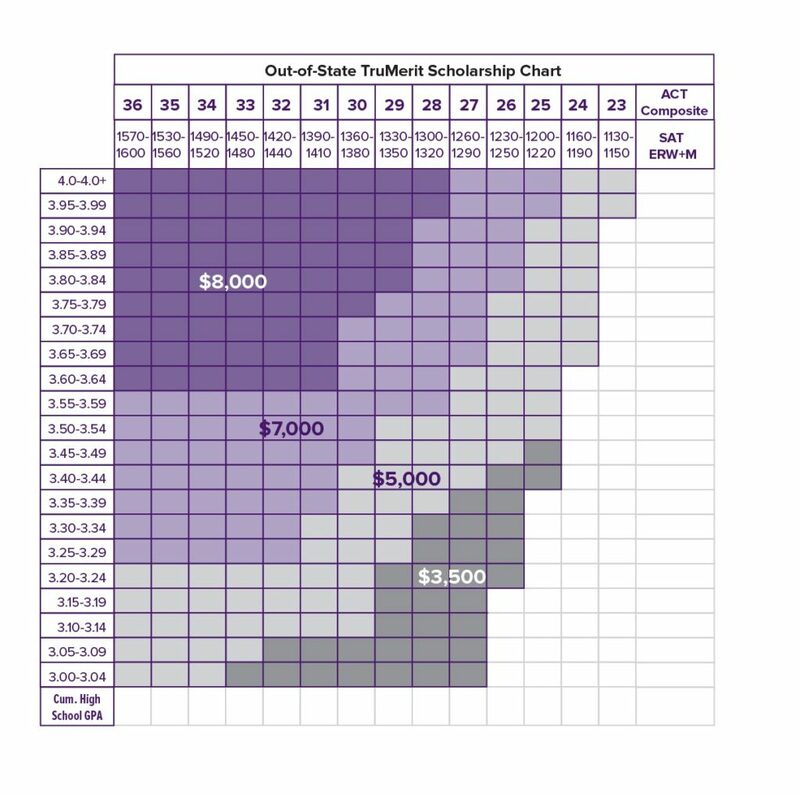 Any student eligible for the University’s TruMerit scholarship is automatically admitted to Truman State University with only an application, transcript and verified test score required. Midwest Student Exchange Program (MSEP) Automatically awarded to admitted students from IL, IN, KS, MN, MI, NE, ND, OH and WI who do not qualify for an Out-of-State TruMerit Scholarship. MSEP amount for 2018-2019 academic year is $3,140. MSEP award value, determined annually, reduces out-of-state tuition to 150% of in-state tuition rate. 3)	Spouse or dependent child of category 1 or 2. Tuition waiver covering the out-of-state portion of tuition ($6,852 for 2018-2019 academic year) granted upon receipt of status verification documents. Students eligible for other larger military education benefits may receive those funds instead. A+ Recognition Truman-funded recognition of Missouri A+ Program completion. $500/yr; A+ Certification must be noted on final HS transcript. The Non-Resident portion of tuition is $6,852. 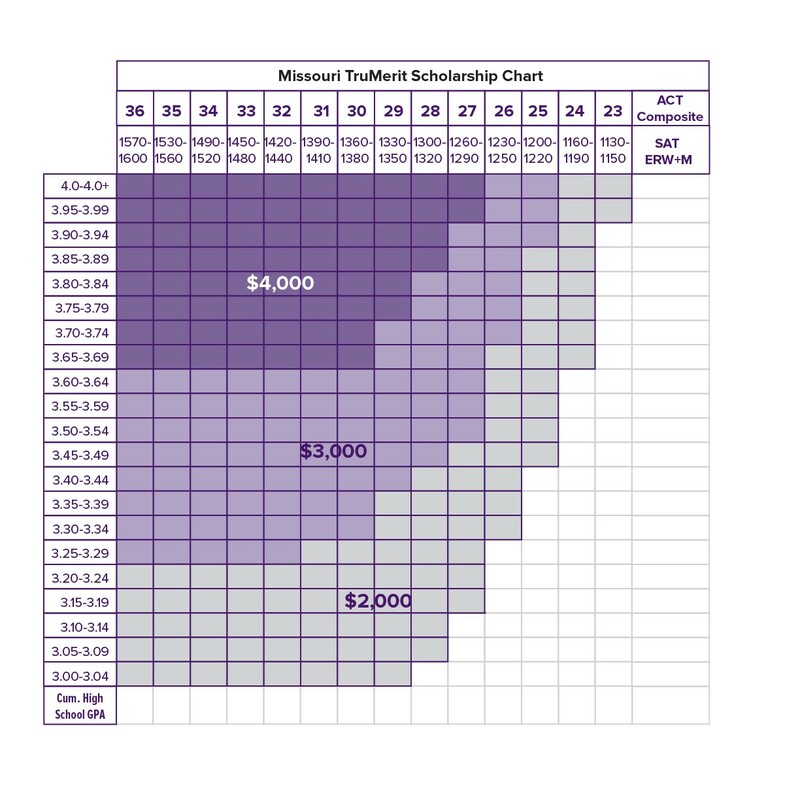 Award packages for Non-Missouri residents are adjusted appropriately if the student becomes a Missouri resident. Out-of-State TruMerit, Military Non-Resident Tuition Waiver and MSEP cannot be combined. Automatic scholarships are awarded based upon your cumulative GPA and college entrance exam scores (ACT or SAT) at the time of application. There is no need to make any special requests — when your GPA and ACT or SAT scores meet the award threshold, the Admission Office will automatically award these scholarships upon acceptance. The best parts about scholarships? Many automatic scholarships and most competitive scholarships can be stacked and renewed. As a Truman student, you will simply need to meet the Scholarship Renewal Guidelines. Planning to take the ACT after you have applied? Maybe you finished your senior year with your best GPA yet? We will continue updating the TruMerit Scholarship and Non-Resident Tuition Scholarship awards throughout the year, reflecting your improvement in GPA and/or ACT/SAT scores. We will accept either the ACT or SAT through the April test date of your senior year and improvements to your final GPA can also increase your automatic scholarship awards. Never fear! Transfer students are eligible for a number of automatic awards as well. Jump over to our transfer scholarships page to learn about requirements and when you should complete your transfer application.